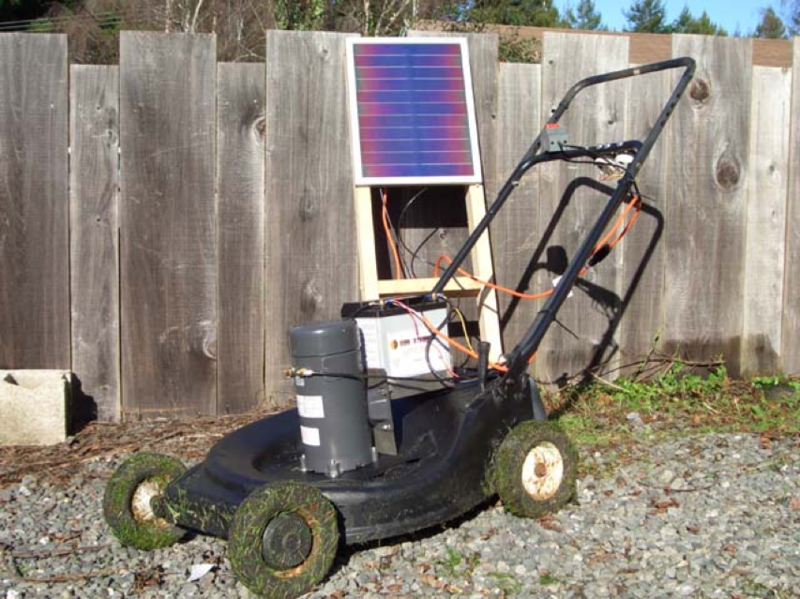 Gas Mower Converted To Solar Power #SolarPower « Adafruit Industries – Makers, hackers, artists, designers and engineers! An electric lawnmower that utilizes solar power as an energy source will address a number of issues that standard internal combustion engine mowers do not. An electric lawnmower with a solar charger will be easier to use. There is no messy dangerous gasoline to deal with. It will eliminate those pesky trips to the gas station for fill-ups. Just plug the mower into the charging station when not in use and it will be charged and ready for your next mow! Most importantly it eliminates the emissions of an internal combustion mower. The basic idea is to convert an older non-working gas mower into an electric powered mower by replacing the gas engine with an electric motor that runs from a 12 volt battery. This battery will be charged using photovoltaic panel (A.K.A. – solar panel). I chose to convert an old gas mower rather than just starting with an electric mower due to cost and so I could design the power output. I also planned on using as many used materials as I can. This will help to save these materials from ending up in our already over filled landfills. The 3/4 HP Dayton motor is specified to pull 58A with a full load. I used this figure to help determine the size battery I needed. I knew I wanted a 12VDC battery, they are easy to find, use, and come in a variety of sizes. The next step was to figure out the amp-hours I needed to run this particular motor for 45 minutes. Amp-hours are a measurement of the length of time it takes to discharge a battery at a certain amperage. For example; a 35 amp-hour battery should give 35 amps for an hour before being discharged. I know I want to run my mower for 45 minutes but I’ll just round it to an hour to be safe. Although the motor is rated for 58A, that amperage is with a full load and typically while mowing I will not be running a full load. While just spinning the blade (not cutting grass) the amps will only be about half of the full load or 30A. So a 40 Amp-hour battery should allow me to mow moderately tall grass for about 45 minutes to an hour. It just so happens that I had a 40 amp-hour deep-cycle battery from a past project. (See below for details on parts and cost). After the grass is mowed I’m going to need a way to charge the battery for the next mow. Luckily, my grass only needs to be cut once every week or two. This allows plenty of time to charge the battery with a solar panel. I had originally planned to build a structure that would house the entire mower then mount the solar panel on the roof. Due to time constrains, lack of yard space, and lack of good stationary solar access I decided to build a small portable solar charging station. This will allow me to easily store the mower in the garage while placing the charging station in direct sunlight.